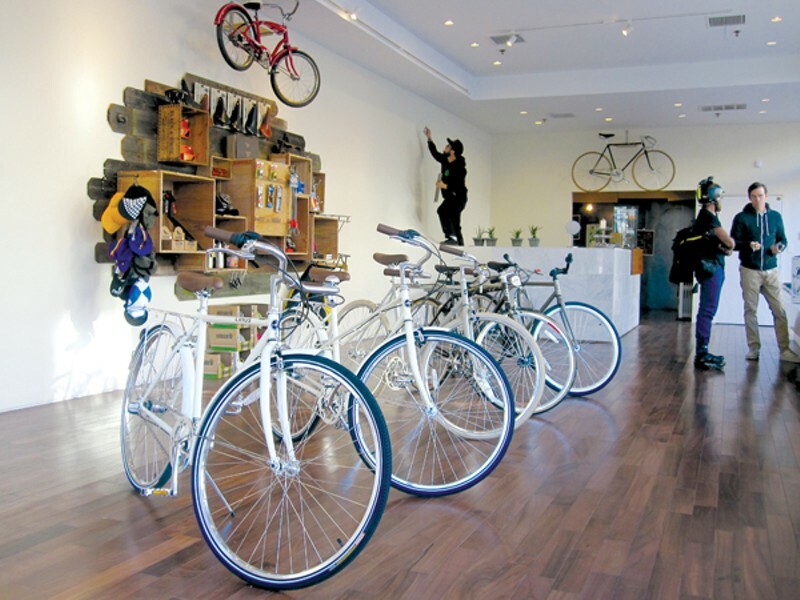 Plinio Hernandez Manifesto Bicycles' new showroom. It's been quite the couple months for downtown Oakland. But even amid — and, in fact, because of — the near-constant whirr of helicopters and the seemingly constant rallies, marches, and demonstrations, we're reminded of something: Downtown became Occupy's ground zero precisely because of its importance, its position as the nexus of much of Oakland's government and economy, its role as the living, breathing center of the city. And in recent years, the district — and its nearby neighbors, Old Oakland and Chinatown — have come to even better encapsulate all that makes Oakland great, as scores of local entrepreneurs have taken advantage of the neighborhood's prime location to open clothing stores, restaurants, bars, and more, many of them proudly Oakland-centric, among the office buildings. Perhaps the highest-profile example of downtown's new position as an emerging retail hub with a distinct local focus comes from two new businesses occupying opposite sides of Broadway just above 14th. On the west side of the street, The OakCollectiv (1427 Broadway, OakCollectiv.Blogspot.com) is a large, light-filled, sparsely decorated shop selling clothing, accessories, art, and gifts — all made by local designers, at a variety of price points. Co-owners — and designers themselves — Penelope Adibe and Rachel Konte apparently intended to create a San Francisco-style shopping experience in the heart of downtown Oakland, and, save for the BART fare and long lines, they seem to have done it. And on the other side of Broadway, Oaklandish (1444 Broadway, 510-251-9500, Oaklandish.com), long relegated to selling its uber-popular hoodies and T-shirts at farmers' markets and online, has finally opened its first brick-and-mortar store, stocked floor-to-ceiling with the brand's signature designs, as well as those of other local T-shirt companies, and a small selection of gifts. Altogether, it's a foolproof place to buy gifts for out-of-towners and Oaklanders alike, and it's been consistently full of customers since it opened. Farther down Broadway toward the waterfront, Old Oakland has sometimes struggled to retain retail in the past despite its unaccountably charming Victorian buildings, quaint feel, and popular bars and restaurants. But thanks to a new initiative called pop-up hood — in which local businesses were offered six months' rent free in previously vacated storefronts — the historic neighborhood feels more alive than ever. Occupying a large, picture-windowed storefront on the highly-trafficked corner of 9th and Broadway, Manifesto Bicycles (831 Broadway, 510-444-9911, WeAre Manifesto.com) — which also has a location in North Oakland — may be the most visible of these, with its large showroom full of unaccountably attractive vintage and vintage-inspired bikes, but the rest of the neighborhood has lots to offer folks interested in a boutiquey shopping experience. Next-door neighbors Marion and Rose's Workshop (461 9th St., MarionandRose.com) and Crown Nine (461 A 9th St., Crown-Nine.Tumblr.com) specialize in jewelry and home products — all made by local designers, naturally, and the vast majority totally handmade — making them in tandem one of Oakland's best-kept shopping secrets. And don't be fooled by the name of Piper and John General Goods (465 9th St., PiperandJohnGeneralGoods.Tumblr.com); the store's wares are anything but average. We're talking vintage tea sets, brightly colored sunglasses, and locally made jewelry, all at low prices. And all this development isn't just retail. As new bars and restaurants continue to set up shop in Uptown, there's still a whirlwind of activity below 16th Street, too. Among them: Cosecha (907 Washington St., 510-452-5900, CosechaCafe.com), a cute farm-to-table Mexican restaurant housed in a turquoise-walled stall in Old Oakland's Swan's Market; Cafe Gabriela (988 Broadway, 510-763-2233), a sunlit little sandwich shop that's already gained a cult following for its mouthwateringly delicious pulled-pork sandwiches and super-friendly service; and Faz (1111 Broadway, 510-272-1111, FazRestaurants.com), the Mediterranean-oriented replacement for the much-loved Caffe Verbena, a favorite for workday lunchers. And coming soon is Awaken Cafe, which, after losing its lease in another downtown storefront, is set to open any day now in a newly renovated space next door to OakCollectiv at 15th and Broadway, thanks in part to a community fundraising effort. According to owner Cortt Dunlap, the cafe will serve a full menu of espresso drinks, as well as snacks, beer, and wine — making it the consummate place to unwind after a full day of exploring the neighborhood. Update:A previous version of this article misspelled Rachel Konte's surname.